Force is what the Vatican has planned. She gets her orders from the Queen of Heaven, that old serpent, who inspired the deception of Eve, the first woman. The serpent is now deceiving the whole world into mass murder–called war and retaliation. Vengeance and mass murder is already in progress. It will soon turn to nuclear, as Yahweh shows. I am Yahweh’s Last Days’ Witness with a Last Days’ Warning to all nations. I also have a non-war solution that all nations would agree to live by if it was taught fully to all people on Earth, and if they knew their religious leaders agreed that everyone teach and follow this way. The use of force started with Cain. It has continually grown worse over the years. The same book that shows the history of Cain, shows the future of mankind in this present, prophesied generation. The Prophecies are found in The Book of Yahweh or the renditions such as the one called the bible. These Prophecies are proven to be absolutely True and you can trust that the last few will be fulfilled. There has not been one single historic event, given in The Book of Yahweh, that has ever been proven wrong. As for Prophecy, the actions of the nations in this present, prophesied generation are proving every Prophecy for this time period True. The increase in knowledge was prophesied for this generation only. The nuclear bombs that can darken the sun were prophesied for this generation only. Yahweh’s Witness who reaches all nations with the Message of Yahweh, from one location, was prophesied for this generation only. Notice the absolute, undeniable Truth. The Prophet Daniyl was inspired by Yahweh to foretell, in the year 534 BCE that knowledge would be increased in this present generation. Notice, ‘time of The End’. Knowledge was increased in the ‘time of The End’, starting in 1934. Daniyl said knowledge would be increased, and due to the increase in knowledge, there would come to pass the greatest time of trouble ever in the history of man. Without the increase in knowledge, that started in 1934 with the computer, the nuclear bombs that were invented in this generation would not be possible. In 1934 the main horsepower was that of horses. In fact, my family, and many others, traveled to town and back in wagons pulled by horses. Remember Yahshua Messiah’s Prophecy for this present generation that began in 1934. Remember Yahshua Messiah said the sun would be darkened in this present generation that started, as we already read, in 1934 with the increase in knowledge. The following article, and essay from Discover Magazine, February, 1984, deals directly with the consequences of nuclear war. Did you notice the date? 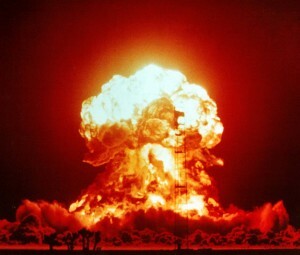 Only fifty years after the knowledge increase scientists confirm that the use of nuclear bombs will darken the sun. Without the prophesied increase in knowledge, the means to darken the sun–the nuclear bombs–would not have been invented. Remember, the increase in knowledge started in 1934, marking the start of this present, prophesied generation. Yahweh warns the world first. The warning for this generation comes from the Two Witnesses. Both the Prophet Daniyl and Yahshua Messiah speak of a prophesied Work of Yahweh for this same time period, to be done by the Two Witnesses. The Two Witnesses were prophesied to be brothers of the same womb. That Prophecy would not start until both were born, the last of which was born in 1934. Yes, I was born in the same year in which both the computer and the bombs started. The Two Witnesses teach the wonderful Blessings that come forth from the Inspired Scriptures. Those Inspired Scriptures were sealed up as Daniyl’s Prophecy shows until the final Prophesied Work in the Last Days was brought forth that would warn all nations, and then The End would come. We should see from history that forced peace will not work. The first example shown is Cain, who chose that way. We are then shown how much he regretted having done so. The true history of Cain and the world that followed starts in Genesis Chapter 4. Verse 13 shows destruction. This prophesied destruction comes both in stages and in unexpected times. The total destruction, which the world has rushed towards since the knowledge increase in 1934 is prophesied, in this generation, to diminish the population by four-fifths. This is the most dangerous time period of any time in history, but Yahweh is offering protection to those who start seeing the mistakes of using force and threats. To those who will repent of sin, which is the cause for the wars and the soon-coming nuclear wars, Yahweh has a protected place. Mattithyah 7:14, 21-23 are the Words of the Savior, Yahshua Messiah, showing the iniquity that the religions are teaching the world. He shows they will not be part of the coming Kingdom of Peace. The destruction is caused by the unrighteous behavior of the whole world partaking of the desirable evil like the Gods. Life comes only by Righteousness, as shown in verse 15…Life by Righteousness. In verse 18, did you notice the words “surely perish”? The prophesied destruction for this generation is here. Four-fifths of the population are soon to perish with famine, disease, and nuclear burning that will darken the sun. Please notice, it’s you who much choose. You can choose to repent and be converted or you can choose to burn with the religions that refuse to practice or teach Righteousness. It’s your choice! In Mattithyah 7:13, Yahshua was speaking of many going the way of destruction. We see this among the nations today. This is not the way of Peace, Joy or Life Eternal. As you just read in Deuteronomy 30:15, Life comes by Righteousness. Read again about the two trees shown in Genesis 2:9. The Tree of Life is shown, then Yahweh gives a warning about allowing evil to be a part of your life; otherwise, dying you will die. The Way of Life is the likeness and image that Yahweh lives and teaches. He gives us Laws that, if taught and practiced, would bring people to unity with Yahweh and their neighbor. It’s a way that everyone can agree upon and live in harmony with one another. Yahweh’s Laws change the whole person. They turn one from the evil of the Gods. The word traditionally translated soul is the Hebrew word nephesh. Gesenius’ Hebrew and Chadee Lexicon by Samuel Tregelles, pages 558-560, shows this word is correctly translated the whole person. Did you notice the word converting? Converting from what to what? A word to the religions, starting with the Roman Catholic Church. Anyone who reads the Laws of Righteousness first sees that these Laws create love between those who follow them. Anyone should be able to see that breaking these Laws of Righteousness; that is, being evil like the Gods, causes hatred, sickness, disease and even confusion of the mind. The reason we see an increase in violence (shootings, bullying), sickness, disease and hatred is because the religions teach the children all over the world (but mostly in Rome, Britain, and the US) that the Laws of Righteousness do not need to be followed. What they’re saying is that morals do not need to be taught, do whatever “feels” right. The “Supreme Court” of the United States teaches America to sin in this generation. All public and private schools teach the children to sin. It started increasing in this generation, and True Love has grown cold. The Savior, Yahshua Messiah, revealed that in this generation, which began in 1934 as you just read, love would grow cold. This is because of the teachings from the school system and the “Supreme Court”. The Savior said this Prophecy would take place in this present, prophesied generation…no other. It’s for this generation only. Read it for yourself in your own bible, or better yet, read it from The Book of Yahweh. The Book of Yahweh is back in print and available to the public after being taken away for 1917 years by the same leader of religions that teaches sin through various means, including the “Supreme Court” and the school system. Now read for yourself what the Savior showed that the Roman Catholic Church and the US “Supreme Court” is causing in this present generation. Did you notice the word iniquity? Iniquity means doing away with or changing Yahweh’s Laws. The Savior said you are fools for not believing all that Yahweh’s Prophets have spoken. Yahweh’s Prophet Isayah shows what changing Yahweh’s Laws of Righteousness will bring upon mankind in this generation. What Would the Sentence be for Practicing, Teaching, and Leading the World to Sin? Come, Yahshua says, and I will show you. I have sent My Messenger to tell you. When? In what time period? Did you notice in Revelation 17:3 and 7 that seven heads are mentioned to identify this great religious leader? What are the seven heads? 9 And here is the mind which has wisdom: The seven heads are seven mountains (hills) on which the woman sits. Burning? This is speaking of nuclear burning–nuclear burning for Rome and as Isayah 24:6 shows…the inhabitants of the earth are burned and few men left. They’re not going away – at least no time soon. Washington intends spending $1 trillion over the next 30 years upgrading its already formidable arsenal – a warning of intent to use against Russia, China or any other nation challenging its quest for word dominance. 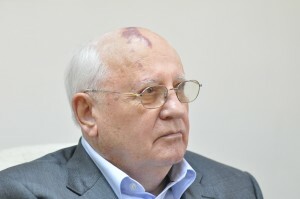 Gorbachev’s message is clear. If these weapons aren’t eliminated, they’ll eliminate us. “Weapons like this have never existed before in history, and they cannot be allowed to exist” – if humanity expects to have any chance of survival. This week, Bill Gertz reported that earlier this month, China conducted the fourth flight test of its DF-41 road-mobile ICBM. “The DF-41, with a range of between 6,835 miles and 7,456 miles, is viewed by the Pentagon as Beijing’s most potent nuclear missile and one of several new long-range missiles in development or being deployed,” Gertz reports. Along with being less vulnerable to anti-ballistic missile systems, this is true for two primary reasons. First, and most obviously, a single MIRVed missile can be used to eliminate numerous enemy nuclear sites simultaneously. Secondly, MIRVed missiles enable countries to use cross-targeting techniques of employing two or more missiles against a single target, which increases the kill probability. In other words, MIRVs are extremely destabilizing because they make adversary’s nuclear arsenals vulnerable to being wiped out in a surprise first strike. …the DF-41 will ultimately be able to carry up to 10 nuclear warheads. This prophesied generation is near it’s end. Remember, this generation started in 1934 with the prophesied increase in knowledge. In verse 16, Yahshua’s Messenger and his job are shown by Yahshua Messiah. The religions could repent and get this mess straightened out now, but Yahweh says they will not. Even after a third of mankind has been killed over the fourth part of the earth in and around the great River Euphrates, you will still keep practicing sin and following the evil like the Gods. The wars around the great River Euphrates started with the Vatican and the Quartet. This is shown in our book Birth of the Nuclear Baby in detail. The exact date of nuclear war is given in Prophecy. It actually started on that date, then held back and it will start again. This is all according to Prophecy. You need a Book of Yahweh and you need the book, Birth of the Nuclear Baby.